Tokyo – Before the exhibition game against NPB Junior All Stars at Meiji Jingu Stadium on Monday, June 29, the managers and players of both teams had a press conference in Tokyo on June 22. The national team Manager Tatsuya Yoshinami (manager of Meiji University) said he wanted to secure victory in order to build positive momentum. Eisuke Tanaka of Chiba Lotte Marines, who was drafted for the first time from prestigious Kyoto University, and Haruhiro Hamaguchi (Kanagawa University) have been nominated as starting pitchers. NPB Junior All-Stars lead by Michio Aoyama of Chiba Lotte Marines includes a number of prospects in 2020 Tokyo Olympics if baseball/softball finally approved by IOC as additional event. The Japanese Collegiate National Team has had two exhibition games last week against leading contenders of industrial league resulting in one win (vs. Toshiba) and one draw (vs. Tokyo Gas). 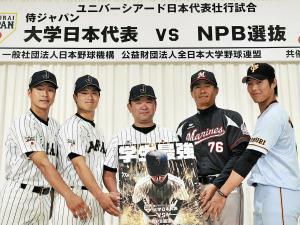 In addition to the NPB Junior Allstars, the collegiate team will play two more practice matches before heading to Korea; vs. Korea National Collegiate Team on June 3 and vs. JX-Eneos on July 1 both at Meiji University’s Utsumi Shimaoka Ball Park in Tokyo. 8 Nations are scheduled to participate in the Championship.